The provincial town lent its name to a major treaty between imperial Russia and the Qing Dynasty. Among Russian historians, the name of Nerchinsk is associated with a late 17th-century treaty that defined the border between Russia and China, but as the Russian Empire expanded in the 19th century, Nerchinsk lost its strategic significance. Bypassed by the TransSiberian Railway, Nerchinsk became another provincial river landing with limited importance for transportation and commerce. Yet this modest backwater was the home of Mikhail Butin and appeared in the travels of Anton Chekhov and George Kennan. The original settlement of Nerchinsk arose from Moscow’s attempt to define its border with China in the mid-17th century. In 1650, the main Russian administrative center was Yeniseisk, located on the Yenisei River to the north of Krasnoyarsk. In 1653, Afanasii Pashkov, the voevoda, or chief administrator, at Yeniseisk, sent Cossack leader Peter Beketov to make contact with leaders of indigenous peoples in the territory beyond Lake Baikal, known at that time as Dauria. By the beginning of 1654, the Cossacks had built a rudimentary fort near the confluence of the Shilka and Nercha Rivers. They were unable to stay, however, because of lack of supplies and the hostility of the local Buryat people. In June 1654, Tsar Alexei Mikhailovich designated Pashkov the voevoda of Dauria, and in the spring of 1656 Pashkov departed Yeniseisk on an arduous journey of over 1,200 miles to the Shilka River. In July 1658, Pashkov’s group reached the remnants of the original Cossack fort, which they reestablished on an island at the mouth of the Nercha River. As early as 1659, the fort was referred to as Nerchinsk in state correspondence. To get to Nerchinsk take a regular flight from Moscow to Chita (Domodedovo airport). The trip takes 6 hours. Than take a bus or a train from Chita to Nerchink. It will take about 5 hours. Over the next few decades, Nerchinsk remained a forward command post for Russian responses to Chinese actions. During that time, Russian settlers pushed eastward to rich lands along the Amur River. Word of the region’s bounty attractedsettlers and fugitives from other parts of eastern Siberia, and the central Amur River valley soon had more settlers than the rest of the Transbaikal. The growing Russian presence led to a collision of interests with the Manchu Qing dynasty in Peking. After military sparring in 1685, the Russian fort at Albazin on the Amur River was besieged by a large Chinese force in 1686. A stalemate ensued for two years as both sides sustained mounting losses in the remote territory. With the signing of the Treaty of Nerchinsk on Aug. 29, 1689, Russian envoys made the best of a difficult situation. Although the haggard survivors were compelled to raze the Albazin fort under the eyes of the Chinese, Russia was at least able to maintain its position at Nerchinsk. With a favorable location near the Shilka River, Nerchinsk became a center for administration and trade with the Manchu empire. 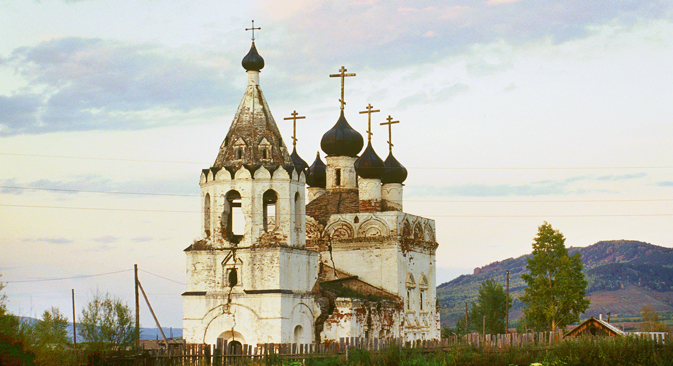 By decree of Tsar Peter I (the Great) in 1706, a monastery was established at the site of the original Cossack fort. The Dormition Church at the Nerchinsk-Dormition Monastery, built in 1712, is one of the oldest Russian churches in Siberia. The main structure and its bell tower now stand in picturesque but perilous ruin. In 1812, Nerchinsk was relocated to ground north of the confluence of the Nercha and Shilka Rivers in order to escape periodic flooding. The dominant structure of the first half of the 19th century was the Cathedral of the Resurrection, begun in 1814 and finished only in 1841. Never completed according to the intended plan, the cathedral now exists in a much-disfigured state and without its bell tower. Nerchinsk struggled to maintain its position as a key point for trade with the east during the 19th century. The town’s mercantile activity was represented by its imposing Merchants’ Court, whose neoclassical design possesses a sense of proportion lacking in the Resurrection Cathedral. After the suppression of the Decembrist uprising in 1825, Nerchinsk and the Nerchinsk silver mines (distant from the town) gained notoriety as a place of exile. Like Irkutsk, however, Nerchinsk benefited from the education and culture of the Decembrists, most of whom were gradually allowed to resettle in more favorable conditions. With the reforms of the reign of Alexander II, the economic development of Siberia accelerated, and Nerchinsk benefitted accordingly. One notable local son was Mikhail Butin (1836-1907), co-founder of a family enterprise in Nerchinsk during the latter half of the 19th century. Butin worked in the tea trade, and his success was so great that in the late 1860s he began a large complex of buildings that included a splendid mansion. Thoroughly vandalized during the Soviet period, the mansion still stands as a monument to this Siberian merchant Xanadu. There is a detailed description of the magnificent interior from the renowned American traveler and writer George Kennan (1845-1924), who visited Nerchinsk in 1885 as part of his examination of the Siberian exile system. Butin was himself fascinated by America and its frontier spirit of development. In 1872, he made a trip across the United States, which he described in a book entitled Letters from America. He also advocated increased trade with China and was among the first to state the necessity for a Siberian railroad. Despite his vision and energy, Mikhail Butin saw his assets vanish in the 1880s through financial crises and related lawsuits. Although the tea trade waned in Nerchinsk, the town’s location near a major river network sustained a level of prosperity. Apart from a few large masonry houses, historic Nerchinsk consists primarily of wooden dwellings, usually of one story with ornamental carving typical of Siberia. In some cases the dwellings were connected to a store. The architecture of the Siberian city of Chita developed as the harsh climate allowed. This city in Russia’s Far East is closer to the major cities of China than to Moscow.